I have something both very cool and unusual for you this week and it’s stone solid proof of the value of the interwebs as a tool for restoring life to otherwise forgotten gold. Last year, not long before Christmas my man Whiteray over at the fine Echoes In the Wind blog posted an article about a cover version of Zager and Evans’ ‘In the Year 2525 (Exordium and Terminus)’ by a cat that I’d never heard of named Nat Stuckey. As it turns out, very cool cover version (of what may have seemed an ultimately uncoverable song) hailed from an even more interesting album called ‘New Country Roads’. 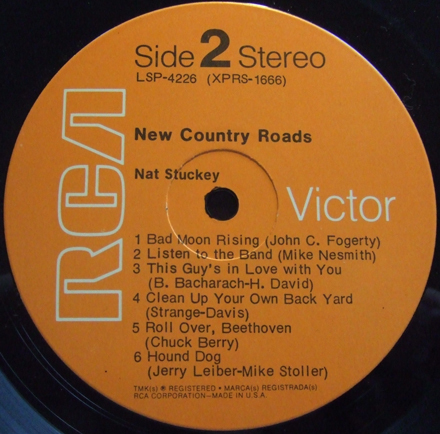 Nat Stuckey was a country singer who’s heyday was contained in a roughly ten year chart run from 1966 to 1976. 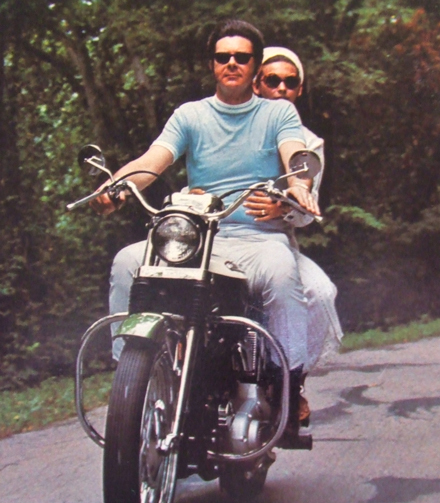 ‘New Country Roads’ was recorded in 1969 and was a concept album of sorts, with Mr Stuckey laying into a wide variety of contemporary pop and rock tunes by the likes of the Guess Who, Creedence Clearwater Revival, the Box Tops, Chuck Berry, Eddie Cochran and the Monkees. Despite the fact that Stuckey’s vocal attack leans in the direction of conventional/Countrypolitan, the selection of tunes was smartly curated, matching up rock material that would lend itself readily to a country interpretation. Now, I have to admit that when I heard Stuckey’s version of ‘Listen To the Band’ I had no idea whatsoever that it was a Monkees tune. You all know I’m a big fan of Messrs Nesmith, Jones, Dolenz and Tork, but for some reason ‘Listen To the Band’ escaped my ears. The thing that grabbed me when I fist heard this version was the drum break in the middle of the song. Then I took a look at the label, saw that it had been written by Mike Nesmith and then tracked down the OG on Youtube. Imagine my surprise when I discovered that Nat Stuckey hadn’t really gone that far afield with his interpretation of the song (up to and including the drum break). The arrangement is pretty faithful to the Monkees’ version and despite a few tracks that shoot right up the middle (‘Bad Moon Rising’) or shock with novelty value (In the Year 2525) ‘Listen To the Band’ is by far the finest track on the album. That it worked so well also manages to be a great illustration of the quality of Nesmith’s country experiments with the Monkees. Though it surely seemed somewhat radical in 1969, today it seems positively conventional.Interestingly enough, the charts seem to reveal that the country audience had little use for Stuckey’s somewhat brave experiment. Though the album made it to number 27 on the country charts (it did fall right in the middle of Stuckey’s chart run) the only track from the ‘New Country Roads’ to chart was his cover of Eddie Cochran’s ‘Cut Across Shorty’ (later covered by the Rod Stewart) which made it to number 15. Welcome to yet another week here at Iron Leg. I hope you all had a chance to check out this month’s edition of the Iron Leg Radio Show, and if now, please do so as soon as is convenient (or head over to the archive and grab them all!). As I was wading through the massive Iron Leg MP3 storage facility trying to decide on what to post this week, I was leaning in the direction of something in a pensive, poppy mode. Then I remembered that I had the Woolies eviscerating ‘Who Do You Love’ all ready to go and went in the completely opposite direction. 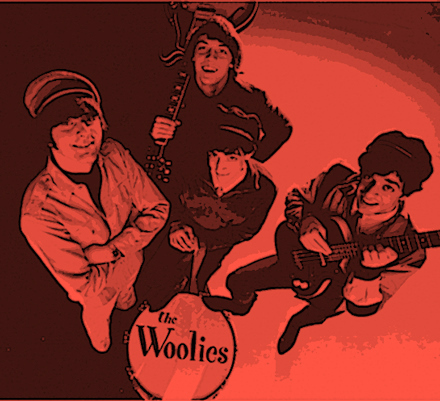 The Woolies were a Detroit-area aggregation that got rolling in nineteen and sixty four. 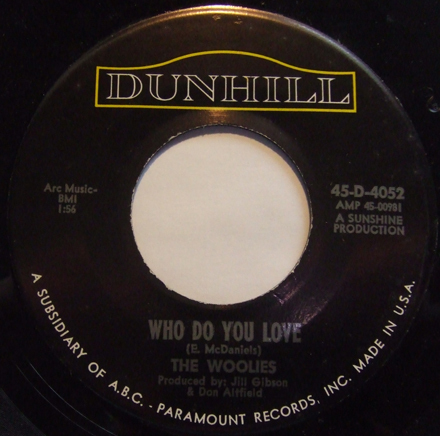 They released some 45s on their own Spirit label (this one picked up nationally by Dunhill), one of which, the aforementioned ‘Who Do You Love’ was a fairly significant regional hit in late 1966/early 1967. Despite the slightly late date, the Woolies version of Mr Diddley’s monument to bad-assery positively screams 1965, in that it carries with it the sound of garage punk as it was crawling from the ruptured belly of folk rock and the British Invasion. You get a shambolic 12-string guitar solo, maracas, pulsing (that’s really all it does, pulse) combo organ and a brutally inept (yet completely fitting) harmonica solo. The vocals by Stormy Rice (he even gets to namecheck himself in the lyrics) are spirited and groovy and the overall attack is very, very solid. No matter that this style was going to all but vanish in a few short months (days?) the Woolies delivered in a fashion often described as ‘balls-out’. I don’t know if I’ve ever said it here before, but back in the day, when I was never happier than when banging on my drums and bellowing into a microphone with the Phantom Five, ‘Who Do You Love’ was by far my favorite song to perform live. There’s something absolutely brilliant about Bo’s lyrics, with tombstone hands, human skulls, cobras, rattlesnake whips and even (yes, EVEN) and ice wagon that is simultaneously bone chilling and hilarious and they were as close as real poetry as ever came spilling out of my maw. That the Woolies, who took off in an entirely different direction after Stormy left and was replaced by a guy named Zocko (seriously) matters not a whit, because this gem is as good as things ever got. I hope you like it too, and I’ll see you all next week. Welcome once again to the Iron Leg Radio Show (episode the eleventh!). This month we get thing started with attribute to the departed Davy Jones, as a Monkee and solo. We also pay a bit of tribute to another artist that passed, the lesser known but very interesting Mike Melvoin. There are – as always – all kinds of groovy sounds, some unusual and extremely interesting cover versions, a couple of old favorites and hopefully some stuff that is new to you. As always, I hope you dig it (and if you do, check out the previous 10 episodes in the archive) and I’ll be back next week with something cool. I don’t know about you folks, but when the news came down last week that Davy Jones had passed away at the age of 66, I was surprised at how bummed I was. I have always been a big Monkees fan, and they’ve been featured in this space a number of times, but for many years, if you’d asked me for a list of my favorite members of the group, Davy would have been near the bottom. I dug the slightly heavier side of the band – if they indeed could be described as having one – and had an aversion to the poppier stuff like ‘Daydream Believer’. I started to realize that Davy was the guy who often interpreted some of the Monkees more interesting later material, including some of my favorite songs by the likes of Nilsson and Paul Williams. 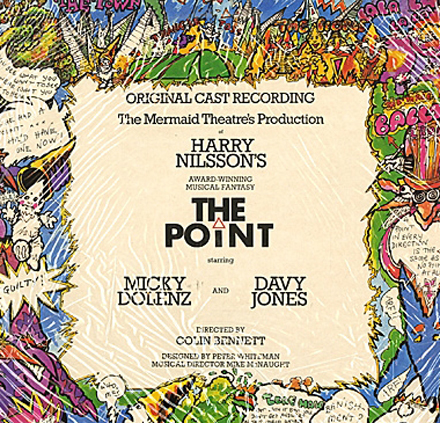 Then, a few years ago, while my sons were falling in love with ‘The Point’, much as I had in my childhood, I discovered that in 1977, a live stage version of the show had been put on in the UK, starring none other than Mickey Dolenz and Davy Jones. That Davy did most of the heavy lifting in the role of Oblio should not have come as a surprise, as his roots were in the musical theater. His first US TV appearance came in 1964 as the cast of ‘Oliver’ appeared on the same episode of the Ed Sullivan Show as the Beatles with Davy in the role of the Artful Dodger. I went out and found myself a copy of the soundtrack album, which I fortunately recorded at the time, since I can’t seem to locate it now (thus the borrowed pic above). That said, it was Davy who assayed my two favorite songs from ‘The Point’, ‘Are You Sleeping’ and the sublime and beautiful ‘Think About Your Troubles’, one of the most interesting songs that Harry Nilsson ever wrote. A friend of mine asked me why I thought that the loss of Davy seemed to hit so hard, and my reply was that I thought that in some way he always remained the Davy of 1966. The Monkees were a touchstone not only for the kids that got to see them when the show first aired, but also for ensuing generations who picked up on them in Saturday morning reruns (like me) and when MTV started re-running the show in the 1980s. The 80s period is especially important in how it relates to the 60s revival period of the middle of that decade. For those kids (and some, like myself in my early 20s) who hadn’t really experienced the 60s in any meaningful way (if at all), the Monkees were a prism through which we observed the lighter side of the decade, as well as pretty much all, non-soul genres of the era’s music. The Monkees made garage, pure pop, psychedelia, sunshine pop and some of the finest examples of the earliest wave of country rock. Talk of their ‘pre-fab’ nature often ignored the fact that many of their contemporaries, even the “serious” ones were often denied the privilege of playing on their own albums (though like most of those artists, the Monkees sang all their own records), as well as the fact that through the years of their career the members of the group wrote some great songs. 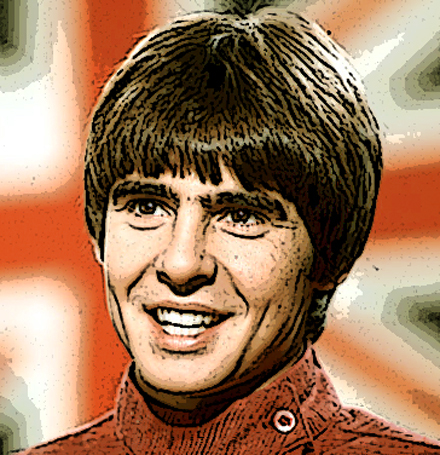 What Davy Jones brought to the Monkees – besides his good looks and charm – was the talents and energy of a real trouper, a genuine denizen of the stage and that aspect of his character was crucial to the formula that made the Monkees both successful and memorable.